Reviews of world literature from 1900 to the present. Consider the archetypical Russian novel: broad, ponderous, many-charactered, loosely historical and partly political. Now increase the political ante by a factor of five and accelerate the narrative arch by about the same amount. What emerges is a stimulant-addled youth’s version of a Tolstoy novel, kaleidoscopic and bewildering. What emerges is Doctor Zhivago. In his beautifully empirical, yet emotionally haunting telling of the Spanish Civil War (Homage to Catalonia), George Orwell gives the reader a blessed pass when it comes time to present the obtuse political niceties of the division-prone socialist militias. Although he argues that the war “was above all things a political war,” Orwell also encourages the reader to gloss over his description of the many left-leaning factions he encountered while fighting: “if you are not interested in the horrors of party politics, please skip.” Many years ago, when I first read this novel, I was struck by Orwell’s considerate warning; even though he couldn’t bring himself to part from the material, he was sufficiently self-aware as to not take it out on the rest of us. In light of this experience, while reading most of the pages of Doctor Zhivago by Boris Pasternak, I must admit that I found myself fairly indignant. Here is a novel that takes the reader on a whirlwind tour of Russia beginning in 1903 and culminating in the early 1940s, employs a rough hundred characters in the telling (more than 30 of whom will be introduced in the novel’s first couple dozen pages), and — at every point — makes bizarrely specific reference to flash-in-the-pan political parties, strange geographies, current (as of 1950) culture, odd laws, trivial plot points, discursive Russian folk songs, and obscurantist moral philosophy. The recent translation from Pevear and Volokhonsky comes accompanied with droves of footnotes intended to bring the contemporary reader up to speed with Pasternak’s random grab-bag of Russian trivia, but it’s a tall order. Tolstoy is timeless. Dostoevsky does fine as well. But, man, is Pasternak anachronistic. I could handle all of this a bit better if Doctor Zhivago could just settle down and stay focused on the same idea (or city or conversation) for more than a few minutes. The text is broken into very short chapters and each chapter is comprised of paragraphs that usually clock in at three to five sentences in length. While this ostensibly makes for pleasant, quick reading, Pasternak omits so much connective tissue from the narrative that the reader is forced to slow down and fill in the gaps. It is slow going, especially in the first couple hundred pages, where the narrative is not at all focused on the singular Doctor Zhivago as the protagonist, but rather a wide field of characters (many of whom are never properly introduced). I made it forty pages in before I had to flip back to the beginning and re-read the opening in greater detail. This additional investment made it no easier for me to catch the many “coincidences” Pasternak presents in the narrative (most of which are comprised of two people chancing upon one another in unexpected terms). An example of such a coincidence goes like this: Character A is introduced, discussed, and dispatched with in the course of eight sentences on page seven; we don’t see Character A again for ninety pages until he accidentally runs into Doctor Zhivago. He’s now married to Zhivago’s niece (or something) to whom we’ve never been introduced. Profound? And all of this is doubly unfortunate, because Pasternak actually has a fascinating story to tell: the story of revolutionary Russia, which put in motion a social sea-change that quickly got out of control and reduced the massive country to a domestic mess as it was right on the cusp of a series of major international conflicts. And the thematic takeaway from these events is compelling, as well: despite our intellectual allegiances, everyday logistics and our emotions can pull us away from even our most deeply-held beliefs. Thus, the revolution for the people begins to kill and terrorize the people; thus, Zhivago is unable to stay true to his wife in the presence of a more alluring woman; thus, the same characters appear in the novel over and over again, but always in different guises and in new roles. The writing is, at times, damnably good. Particular scenes — a dinner party before the outbreak of war, a long train ride through the Russian countryside, several weeks of domestic bliss in a comfy apartment building — will stay with me for a long time to come. Pasternak can create atmospheric, cosmic space around a character just as adeptly as he can shrink that scope down to the close confines of a tiny cabin. When he writes about a character feeling happy, alive, and free, it really does seem as if the entirety of the Russian steppes lies beneath his feet; at the same time, when his characters feel threatened, hemmed in, trapped, the reader also begins to suffocate. Somewhat sporadically, then, I can give credit to Pasternak’s adroit pen. But the total tonnage of Doctor Zhivago is simply too much weight to bear, especially when it’s flopped onto such an uninspiring protagonist. As the symbolic incarnation of individualism in a environment hellbent on conformity, I suppose that Zhivago plays the part. But for a supposedly intelligent, scientifically-minded person, he presents as too much of a naive ninny to be taken too seriously. And many of his personal conundrums are, really, entirely unsatisfactory. He agonizes over whether to choose his wife or a new lover; he chooses the new lover; then toward the book’s ending he takes another lover. Gone is the resolution of the soul-searching quest that dominates much of Zhivago‘s middle chapters. In its stead steps a cur. I don’t know. The historical and political importance of this novel are well-established and the circumstances of its censorship and eventual publication are fascinating. 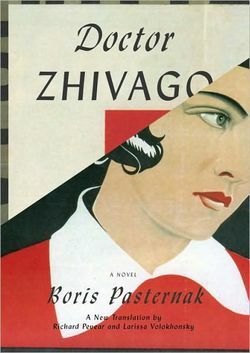 Pasternak was quickly granted the Nobel Prize in Literature after Zhivago appeared around the world although, in hindsight, I think many historians would classify this as more of a geopolitical move (the award was made in 1958 during the height of the Cold War and journalistic accounts of that year indicate that the CIA had a hand in circulating advanced copies of the book to the Nobel Prize committee in an effort to embarrass the Russian censors). But I just can’t get terribly excited about this novel. It’s worth reading for those interested in rounding our their familiarity with the Russian canon, but I’d check out the old guard (and even some members of the new guard, like Solzhenitsyn) before wading into Doctor Zhivago. I found your blog a bit late. I am currently trying to get through this book and can’t. I have read many of the Russian greats, but this one just doesn’t hold my interest for many of the reasons you mention. Glad to know I am not alone.